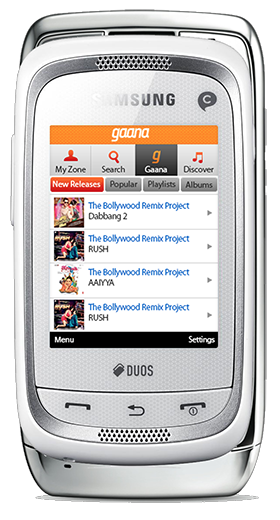 Gaana, one of India’s top music streaming services, just launched its app, which is now available on four platforms (iOS, Android, BlackBerry and J2ME for Samsung and Nokia feature phones) to take advantage of India’s vast but fragmented mobile market. The service, operated by Times Internet, allows listeners to browse through thousands of playlists, save their favorites, and launch radio stations from individual songs to discover similar tunes, based on its proprietary recommendation algorithm. Offerings range from top 20 Hindi songs to Ghazal music, based on an ancient poetic form. Gaana’s website opened 18 months ago. The app was released across four platforms at once in order to grab as many listeners in India as possible. “The multi-platform build is a testament to the device fragmentation prominent in India. Unlike the U.S. where iPhone and Android are dominating the landscape, they still make up a small minority of devices deployed in India,” said Times Internet CEO Satyan Gajwani in an email. BlackBerry devices are still doing well in that country, as are feature phones that use 2G data and J2ME applications (Gajwani expects about 30% of all downloads of the app to be on J2ME devices). Native applications were built for each platform, with a focus on consistent UI, design and experience across all four. “It’s a big thing for us to reach so many devices at once in India, where smartphones don’t rule the day. We built this to be relevant to three audiences: Indians living abroad with higher end smartphones, an upcoming middle class in India with lower end Android phones, and a rural Indian who has intermittent power at home, and so uses feature phones as a central hub for entertainment content,” said Gajwani, who expects a significant influx of listeners who don’t use computers. The app is currently monetizing through advertisements and offering all music for free. “It remains to be seen whether an ad-only model is sufficient to make a successful business, and whether this market will ever evolve towards a pay model when there are multiple players offering free mobile music,” said Gajwani. According to the company, Gaana had more than 100 million minutes of consumption in 2012, 500% more than in 2011, and over 500,000 playlists were created in 2012. The Web site hit 1M registered users two weeks ago, about 85% of whom are connected through Facebook. Fifty-two percent of music listened to is Hindi, while 28% is non-Hindi Indian and 20% is international music. “International skews higher than most people expect, which is why Gaana has partnerships with over 300 labels, including Sony and Universal, the two biggest labels,” said Gajwani. Mirchi Top 20 has the latest popular Hindi music, and Tamil and Kannada top lists give a glimpse into popular regional music (28% of all consumption). In the Discover tab, under New Releases, users can filter music via up to 10 languages, which is relevant for Indians from different regions. As a testament to the community, if you go to Discover, then Popular playlists, you’ll notice that the fourth most popular playlist is created by one of our community users, called “Old Hindi Songs,” which is a great compilation of some classic Hindi songs. Most Indian music is centered around movies, but there’s an emerging category called “Indipop” which is independent of movies. If you search “Indipop” and then go to playlists, there’s a playlist by our in-house DJ called “Indipop” which gives a good selection of upcoming independent music. Finally, a lot of users find navigating by Genre as a way to find smaller, cultural niches of content which aren’t chart-toppers, like Sufi music of Ghazals, which have poetic, Arabic leans but are highly respected in the Indian music scene.